John is a good friend and valued customer. As a former university professor, you know he's a smart dude. Currently he runs a sizable chunk of our Federal government and very rarely does he lose his cool. With this in mind, I found it very surprising when he walked in one day and tossed me this VHS tape. Then after a few expletive deletives, he told me how he signed onto the Handyman Club and couldn't get signed off. They kept sending him something every month, whether he wanted it or not, and expected payment in return. John was tired of sending the stuff back so he had given up, giving their latest offering to me. "What am I going to do with this piece of (expletive deleted)? ", he said. "I don't even have a tablesaw!". After such a negative introduction, it wasn't easy to muster much enthusiasm for this review. Still, I carried on and found myself pleasantly surprised. Other than the beginning, where we are welcomed to the Handyman Club by it's "deer-in-the-headlights" president, Tom Sweeny, Table Saw Techniques is a first-rate production. Video-wise, it's a standard two camera, one videographer shoot with excellent sound and good one-take video shots. Unlike the last woodworking video we reviewed, the transitions and titles were professional and non-distracting. I was impressed! The star, Dr. Roger Cliffe, was equally impressive with his relaxed demeanor and acceptable air of authority. To be honest, the impression I had from his numerous writings had to be re-thunk. He seemed like an OK guy! As to the content, I'm afraid advanced woodworkers aren't going to get much from this video. Using the tablesaw to make moldings or cutting compound miters with a sled is nothing new. But beginning woodworkers can definitely benefit from seeing a variety of different applications, especially where workarounds are used to negate the hassle of using a guard. Illustrated were a variety of hazardous pitfalls and how to avoid them. 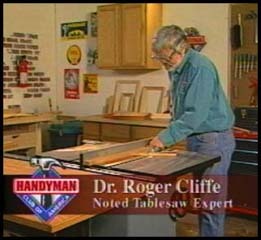 Dr. Cliffe seems very comfortable with all safety gear in place, and I learned a thing or two if I ever un-bury my tablesaw guard from the corner of the shop. Another thing I liked was Dr. Cliffe's sense of humor. Tape measuring was scarce during this production, and we find the star eyeballing a fence position instead of pulling out a ruler. To explain this lack of precision, we hear from Dr. Cliffe, "If you don't measure, you don't make measuring errors." I roared with laughter! Should you go out and join the Handyman Club so you can get this video? I don't think so unless you want to risk having an attitude like my friend John. But Dr. Roger Cliffe's engaging style is hard to resist and beginners might want to look for his titles elsewhere. It's so much better if you can actually see someone do something, as opposed to just reading about it in a magazine.